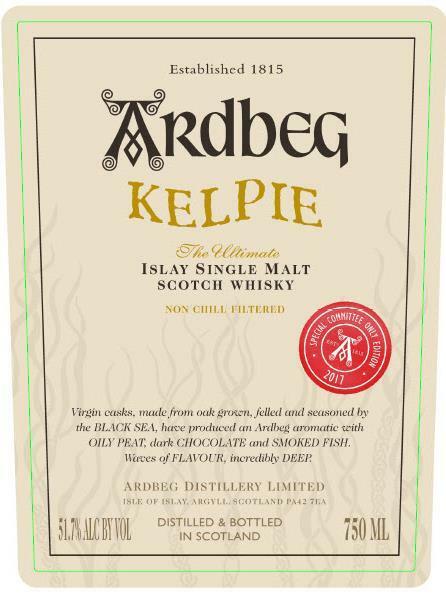 2017 Ardbeg Day release - Ardbeg Kelpie? 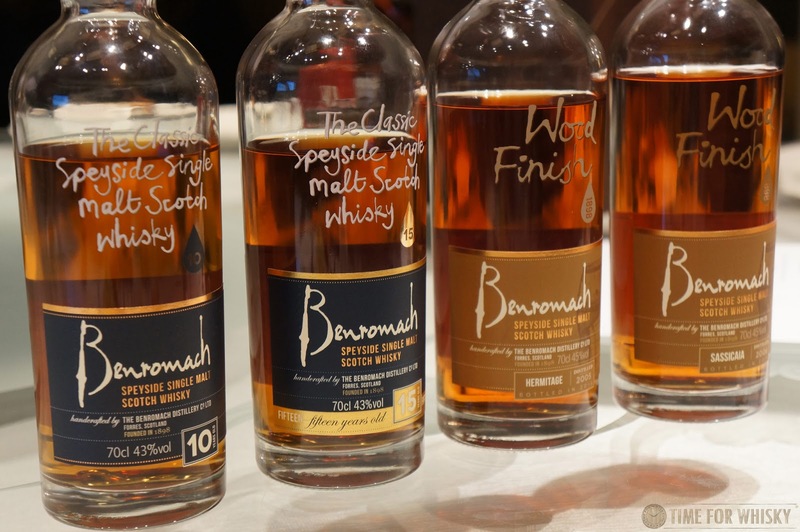 TimeforWhisky's prediction from 12 months ago coming true? 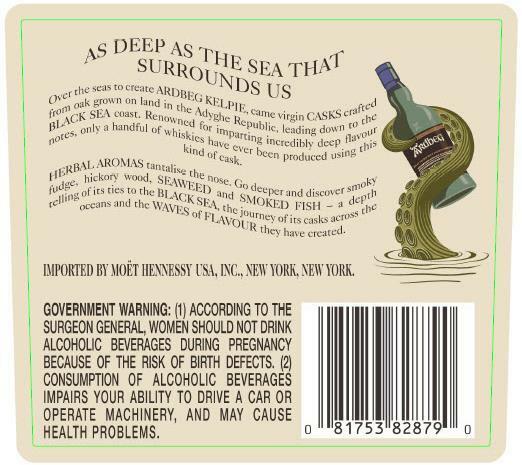 "...oh, and about a little experiment Dr Bill is in the middle of, involving Ardbeg aged in Russian Oak. Although coy on the details (when asked for his thoughts on the impact Russian Oak has on the spirit, he said to ask again in 2 years), Dr Bill did suggest that the project (codenamed "Ardbeg KGB" within the distillery), could well be a future Ardbeg Day release. 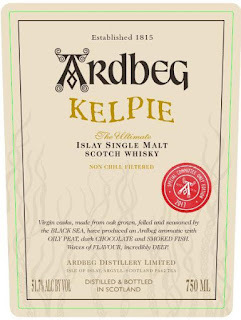 We've seen "Islalympics" (2012), Archaelogy (2013), Soccer World Cup (2014) and Space (2015) as themes, so can we expect to see a Russian-themed Ardbeg Day in the near future? Perhaps." Now just because Moët Hennessy have filed a few images with the TTB, that doesn't automatically mean we'll see the whisky released, but in the past their database has been a relatively reliable source of information, and the timing seems to line up based on our 2015 discussion with Dr Bill, when he suggested the Russian Oak experiment wasn't quite ready, and to "ask again in 2 years". If this is indeed going to be a future release, we could see a similar approach to this year's Dark Cove, with a Committee release at a higher ABV (51.7% if the label above is to be believed) and a lower strength "general release". 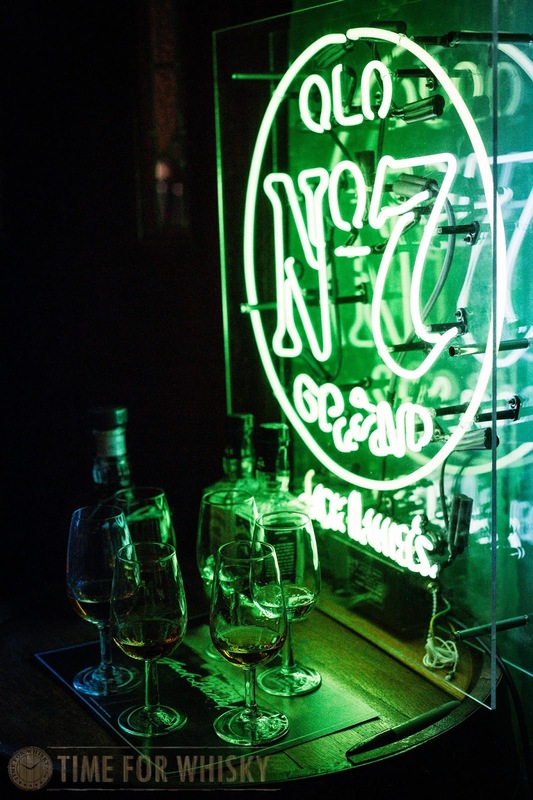 Whatever the case, it gives us something to speculate over for a little while (whilst we wait to see if that 21 year old Ardbeg actually gets released). I for one would very much love to try a Russian oak-aged Ardbeg! PS: As much as we wanted the label to feature an Australian Kelpie, in this case we suspect the name refers to the mythical Scottish horse-like creature. Mention "American Whiskey" to many people, and you're likely to get a response along the lines of "Oh, you mean Bourbon?" or maybe rye if they feel they know a thing or two. 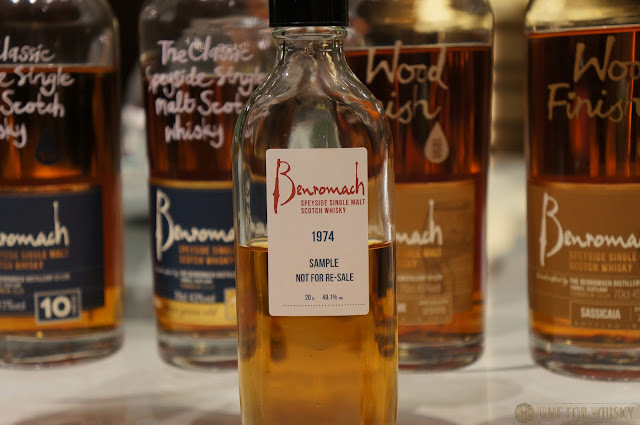 American single malt though, is a category that's still relatively unknown and even though there's a lot of it around (and has been for a while), is still seen as being in its relative infancy. At a minimum of 2 years old (26 months for the Sherry Wood) they're not old nor super complex, but nor are they trying to be. Aiming to showcase the rich barley of Washington state, the whiskies are designed to show what attention to detail, quality ingredients and intelligent maturation can produce. Nose: Honey, caramel, BBQ'd pineapple. Very pleasant. 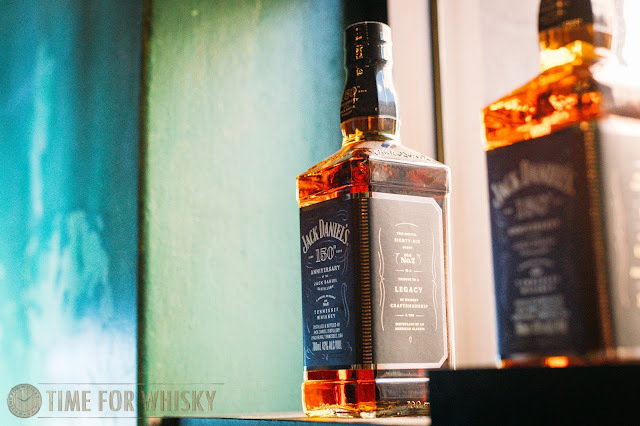 Palate: Smooth but rich. Toast, pork crackling, oranges drizzled with honey. Its 46% ABV feels spot on. 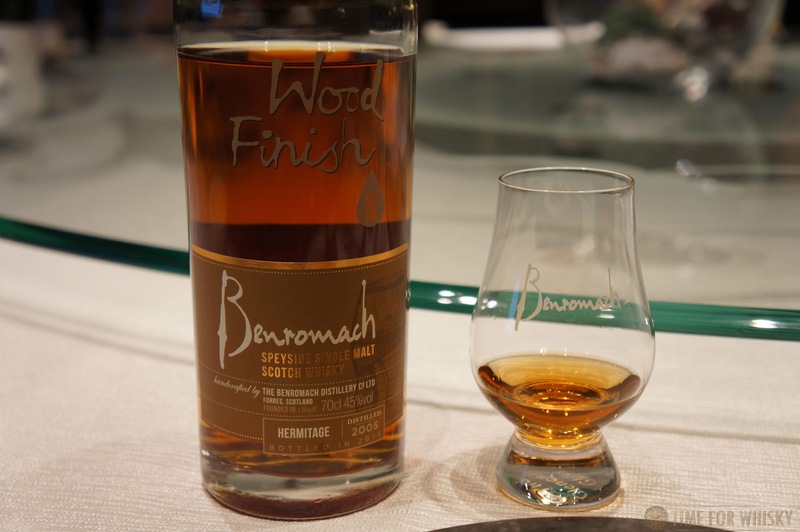 Finish: Short to medium length, with slight rubbery notes initially rounding out into bitter cocoa notes. Rating (on my very non-scientific scale): 88/100. Very drinkable, and quite impressive given the young age of both the whisky and the distillery. Nose: Toffee and caramel, raisins and maple butter. Some sweet PX notes with red berries. Palate: Crisp and clean, with brazil nuts, a slight meatiness, oak and continuing creamy maple butter. Finish: Medium to long length, creamy, sweet, slightly drying. 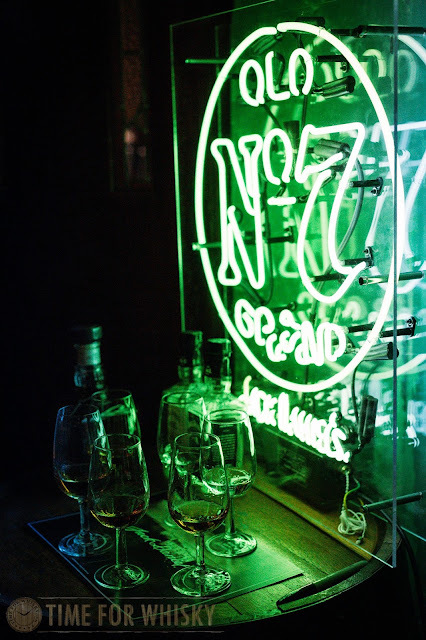 Nose: Initially gives sweet, meaty, citrusy peat notes. Think honey orange-glazed BBQ pork. 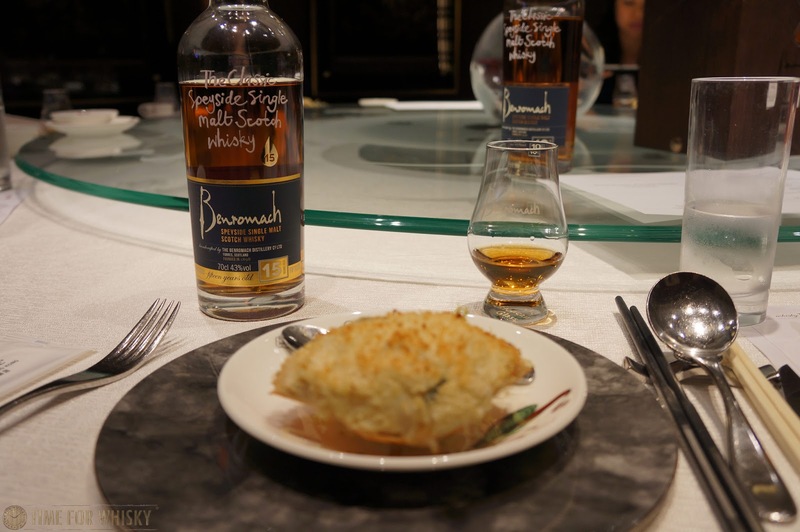 The peat is noticeable, but subtle. 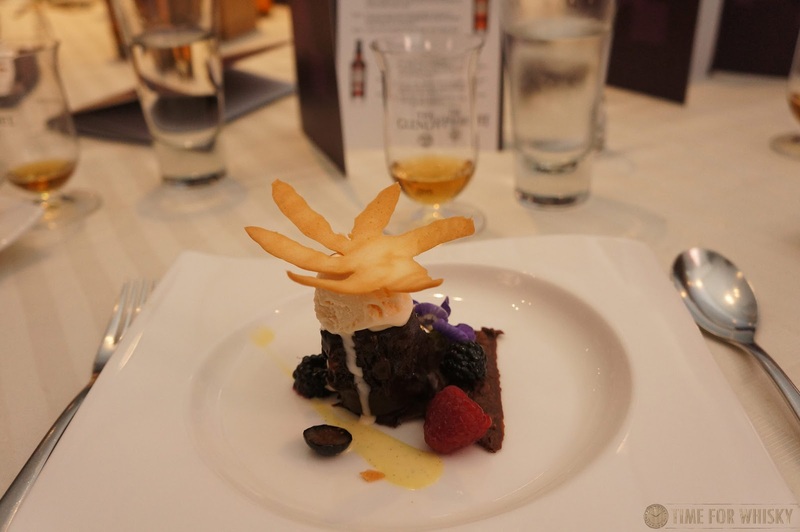 Palate: Peat smoke that's simultaenously earthy and sweet, and slightly peppery. It's unique, but very enjoyable. Burnt toast, BBQ'd pork and charcoal-roasted pineapple. Finish: Medium length, slight earthy smoke with a residual sweetness to the end. Rating (on my very non-scientific scale): 91/100. Very enjoyable (especially the palate) and definitely my favourite of the three. 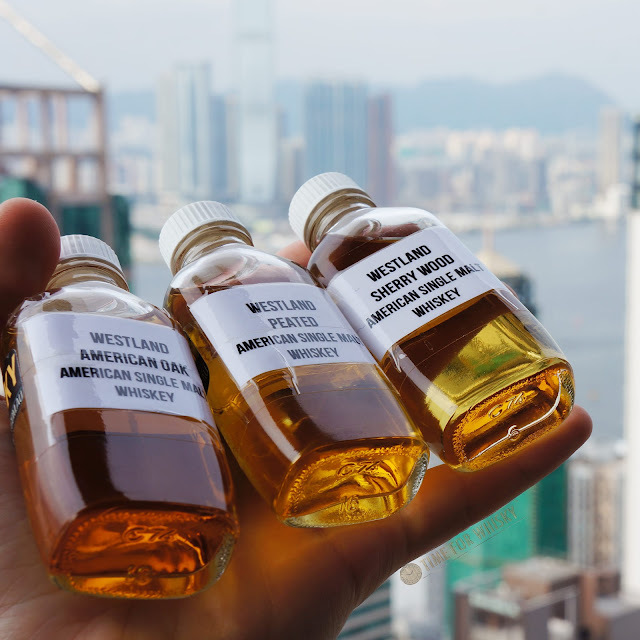 The range of Westland whiskies will soon be available from Alba Whisky in Australia. Thanks to Ian for the generous samples. A month or so ago, a mate tagged me in a Facebook post highlighting a new cocktail bar in Hong Kong opening soon, called J.Boroski. Not being familiar with it, I did a little Googling which promptly turned up exactly one result, with no details whatsoever. 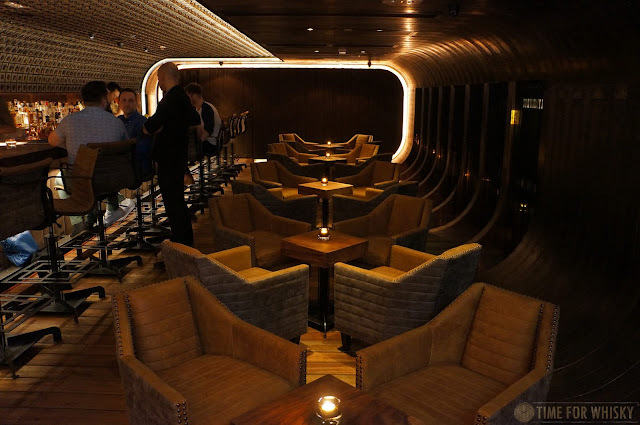 A little more Googling told me it was the HK outpost of a popular Bangkok bar by the same name, with both interiors designed by Aussie Ashley Sutton (of Iron Fairies Bangkok and Ophelia Hong Kong fame). 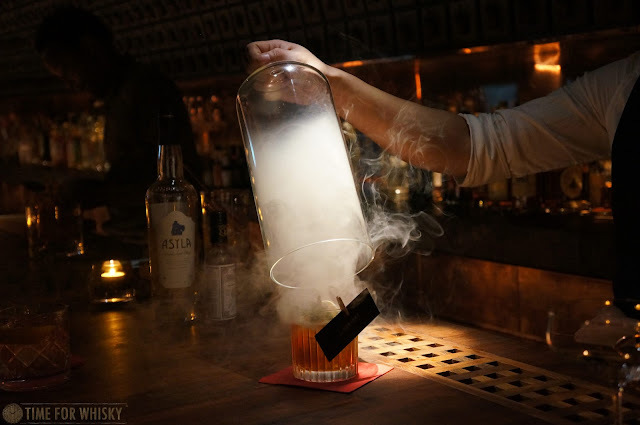 Despite only opening a few years ago, the cocktails at the Bangkok bar were said to be world class, so obviously we were keen to see how the HK version stacked up. So a few weeks ago I reached out to Joseph (the "J" in "J.Boroski") and made a reservation for Steph and I for a Saturday night. Finding the place was a challenge at first (the directions were something like "go down a little laneway, look for the graffiti, go down the hallway, through the door at the end, turn right" but we managed, and after confirming details with the host, were taken to our bar seats. The first thing that strikes you is just how simultaneously exquisite and refined the space is. 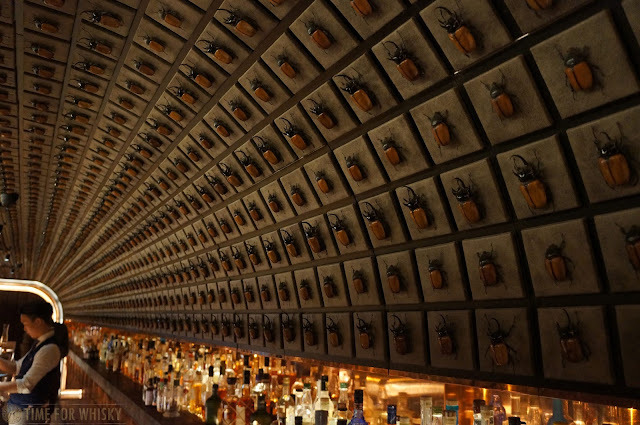 It's unique (how many other bars have their walls/ceiling adorned with life-size Rhino beetle tiles!? 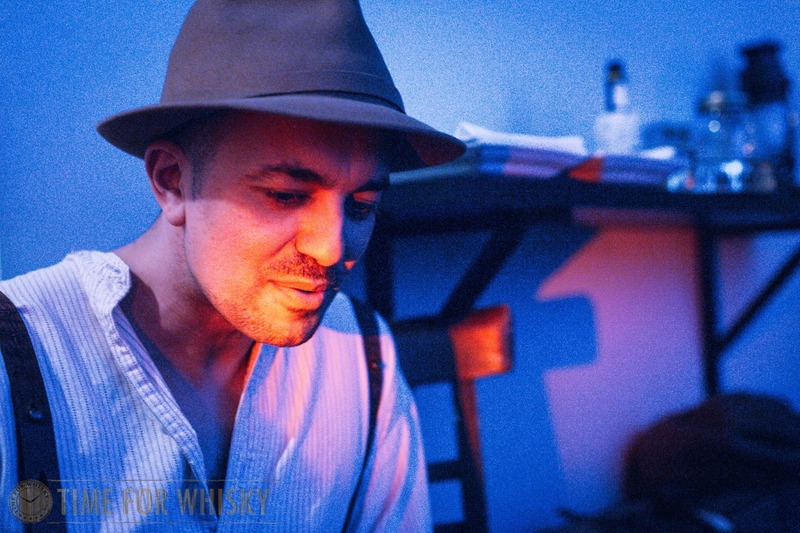 ), but it works brilliantly when coupled with the warm wooden furnishings and comfortable suede chairs. The other thing that struck us was how quiet it was. We arrived at 8:30pm on a Saturday and had the entire place to ourselves (literally) for almost 2 hours. Of course, I should mention that at that point, the bar hadn't even been in "soft opening" mode for a week, and still wasn't officially open. 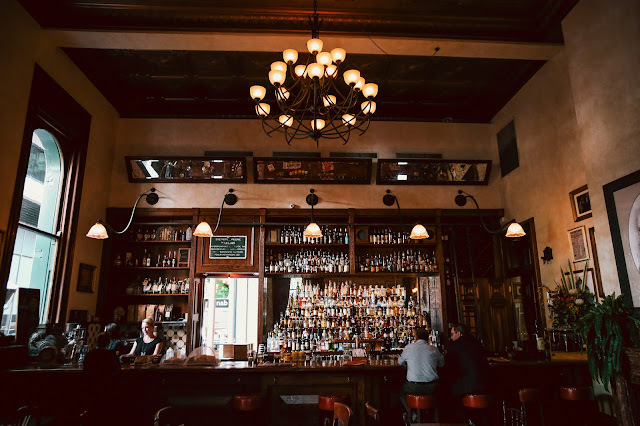 I returned a few weeks later on a Monday, and as expected it was much busier, with the bar seats all full by 10pm. J.Boroski HK operates on an "invitation only" basis and whilst that might initially seem a bit wanky, it's purely to ensure there's space for guests so everyone can be looked after. 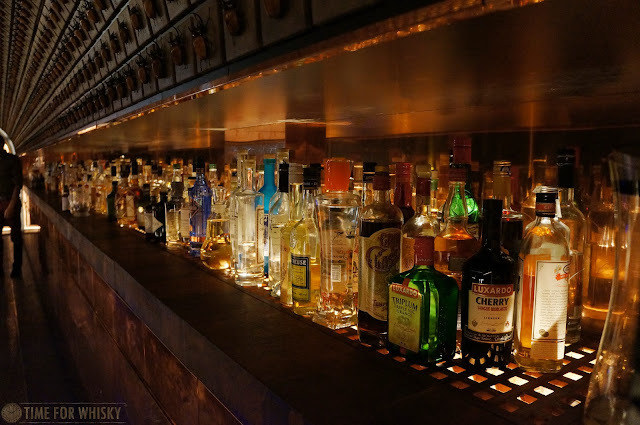 It's a small, intimate space, and they want to ensure every customer gets the appropriate amount of attention. 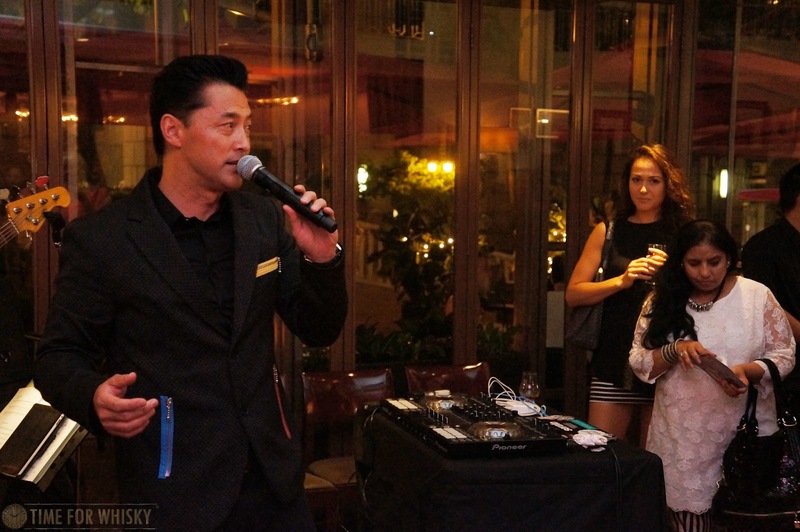 Invitations can be requested by e-mailing hk@jboroski.com. One look at the backbar (an eclectic mix of American and Scottish whiskies, gins, rums, tequilas, Mezcals, and more infusions and home-made syrups than you can imagine) and you could tell this was a serious cocktail bar. You might reasonably expect they'd have a pretty incredible cocktail menu too, but you'd be wrong! The bar eschews menus in favour of the bartenders discussing flavours / preferences with customers, and creating a drink to suit. 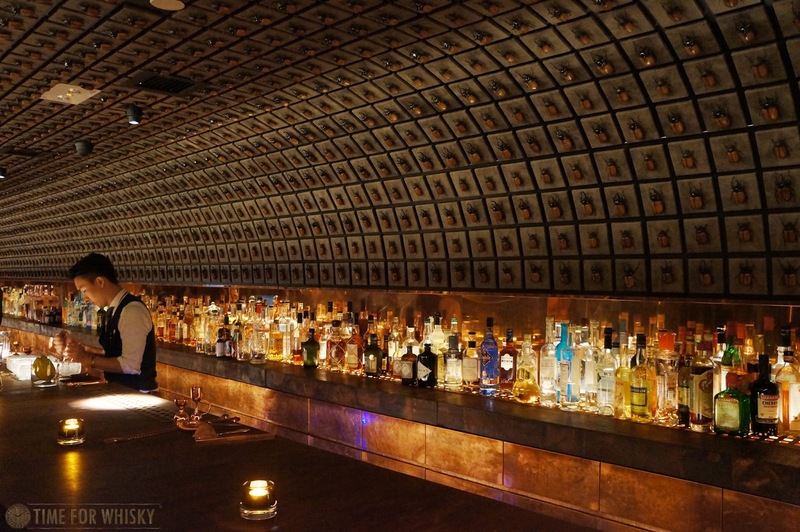 We love bars that back themselves enough to "throw away" the menu, and it's done brilliantly at J.Boroski HK. Feeling in the mood for something similar to a Negroni to kick things off, our bartender Nathan Tse (previously of Bitters & Sweets) suggested a variation made using a Thai gin. Slightly smoky, bitter and perfectly balanced, it hit the mark wonderfully - a theme that continued with every drink we tried. 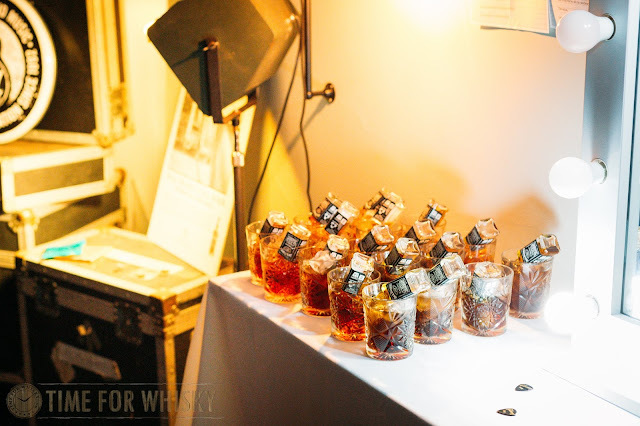 On a later visit our group requested a mix of "Classics with twists" and "Classics" - from a smoked Manhattan-style drink with coffee-infused Bourbon, to a crisp, sharp classic daiquiri, every single drink was spot on. The team here might be new, but they're already matching the best Hong Kong has to offer. 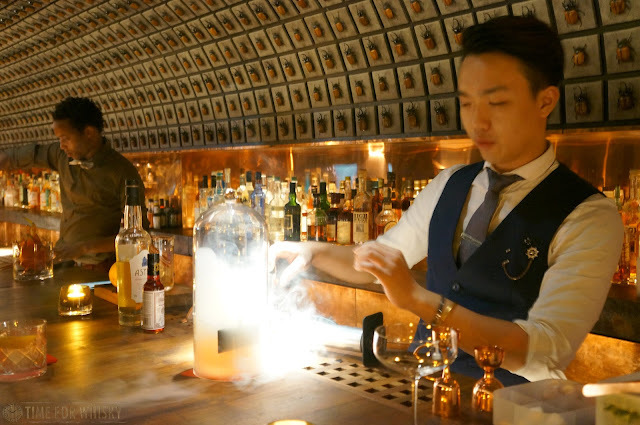 Drink prices are on par with any other high-end cocktail bar in HK (expect cocktails to be around $150HKD, depending on base spirit) and considering the thought and effort that goes into each (not to mention the fantastic end result), and the personalised service, it's a fair proposition. 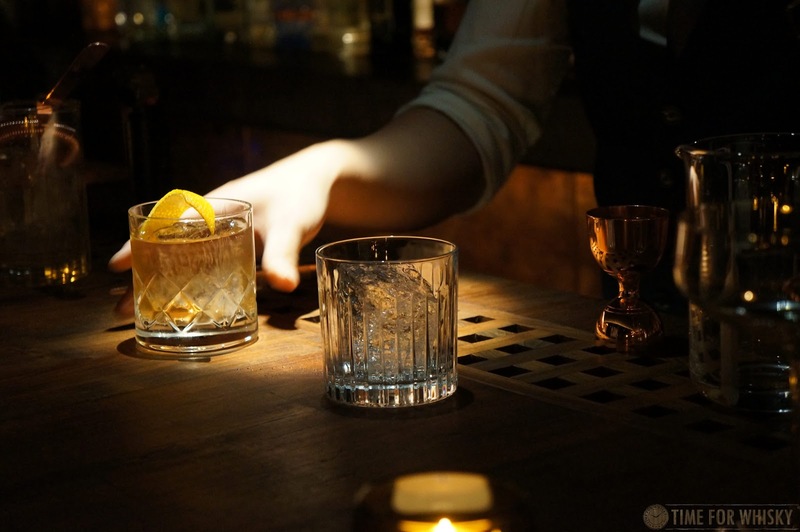 If you're a fan of cocktails, we highly recommend making a booking and getting yourself down to J.Boroski sooner rather than later. You won't be disappointed, and you'll probably be blown away. 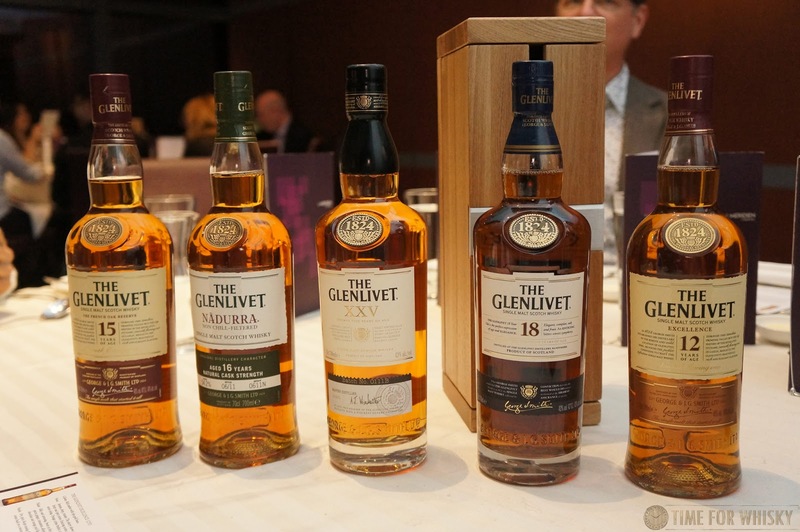 Steph and I had barely been back in Hong Kong a few days (after a great trip to Sydney) when an invite arrived for a whisky dinner with The Glenlivet, to be held at Le Méridien Cyberport. It'd been a few years since the last Glenlivet dinner we attended, and although Steph had plans, my fondness for The Glenlivet (and you know, eating..) meant I wasn't about to say no. So on a Friday night recently, myself and good mate Eddie Nara jumped in a cab and headed towards "Sou ma gong" (Cyberport). Upon arrival we were greeted by Darren Hosie (Regional Mentoring Manager for Chivas Bros and good friend of TimeforWhisky) and handed a cocktail made with Chivas and...Dragonfruit?! Different, but it worked perfectly as a refreshing antidote to the heat outside. Taking our seats shortly after, the hotel's GM gave a brief introduction and explained how the hotel has run successful wine dinners in the past, but was looking to expand into whisky, hence the five malts laid out in front of us. With guests ranging from whisky novices to enthusiasts (and one CEO of an Australian distillery...) Darren gave a brief introduction into how to taste / appreciate whisky, before we jumped into the first dram - The Glenlivet 12 Excellence. We first tasted the Excellence earlier this year with Charlie Maclean, and enjoyed the sherry matured notes that aren't present in the regular 12yo (the "Excellence" is designed for Asian palates and distribution is limited to only certain countries in Asia). 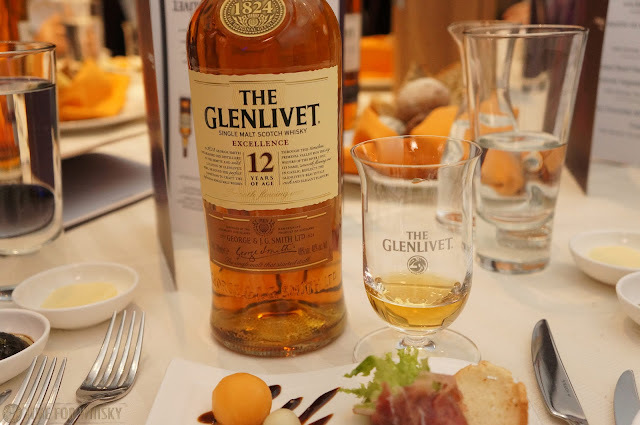 With hints of chocolate, orange, paprika and cinnamon, it's noticeably different to the regular 12yo, and when paired with Parma ham and (vodka-infused) melon balls, proved a great way to kick things off. Next came Steamed Foie Gras with Banana Chutney paired with The Glenlivet Nadurra. 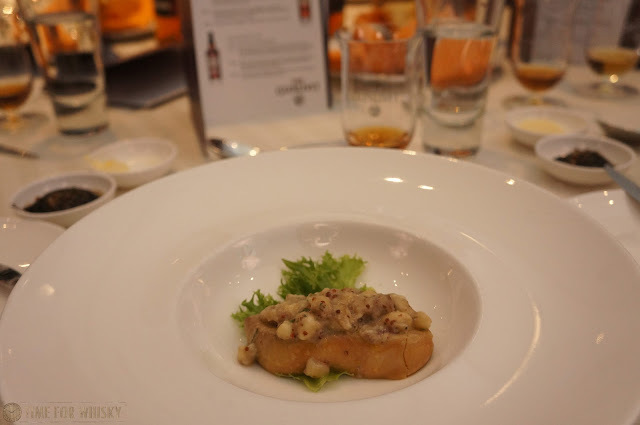 Whilst not the most visually-appealing dish, it was spot on in terms of flavours, and matched better than I'd expected with a cask strength whisky like the Nadurra. Gazpacho on a heavenly-cloudy peach malange was next, paired with The Glenlivet 18. Given the spiciness of the dish, at first I thought this might have paired better with the Nadurra....but that just goes to show you why I'm not a chef (or food pairing expert). This was a fantastic pairing, with the spiciness of the dish picking up the some of the cloves and asian spices in the 18yo, and adding an overall Demerara-like sweetness. 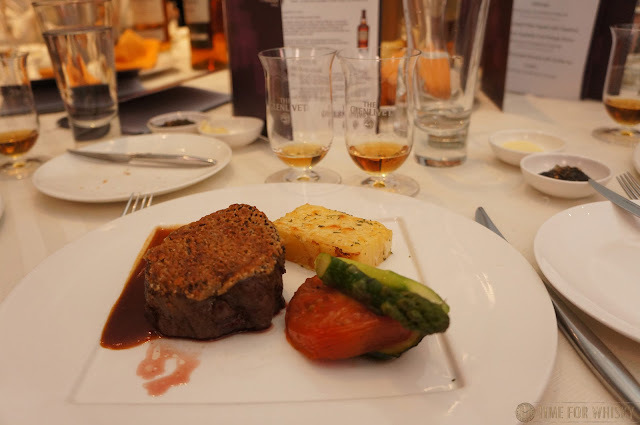 Next came Roasted beef fillet topped with Hazelnut, seasonable vegetables and orange gravy, paired with The Glenlivet XXV (25yo). 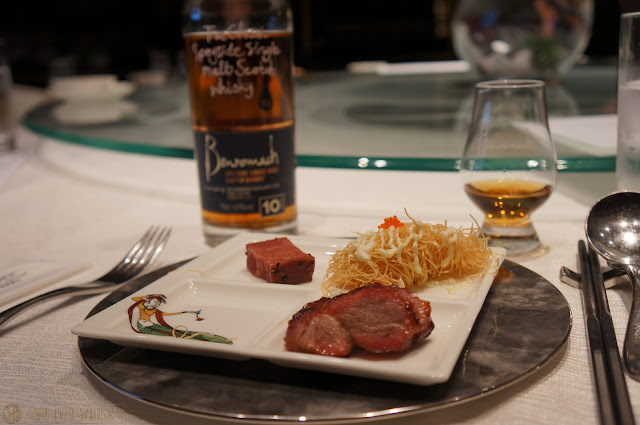 A subtle / nuanced dram with a simple dish like a well cooked piece of beef was a smart option, and again these two complimented each other well. Desserts often provide an opportunity for great whisky pairings, and this was no exception, with Whisky chocolate mousse with vanilla ice cream playing nicely off the sweeter, apple-like notes in the Limousin-aged The Glenlivet 15yo French Oak, even adding some hints of cinnamon that weren't obvious in either the dish or the whisky on their own. 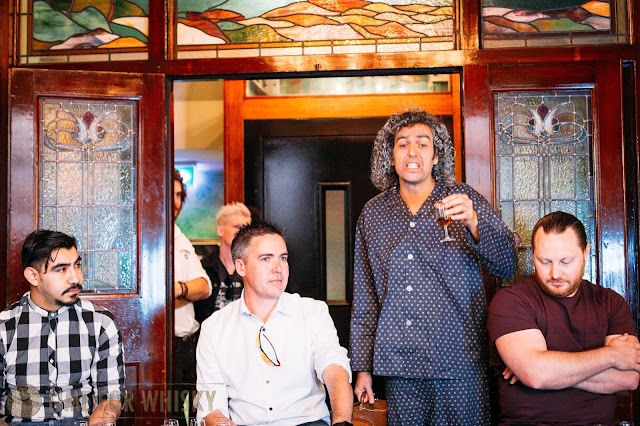 In addition to the whisky and food pairings being a big success, the event also struck that perfect balance by being informative without going over guests' heads (or worse, putting them to sleep). 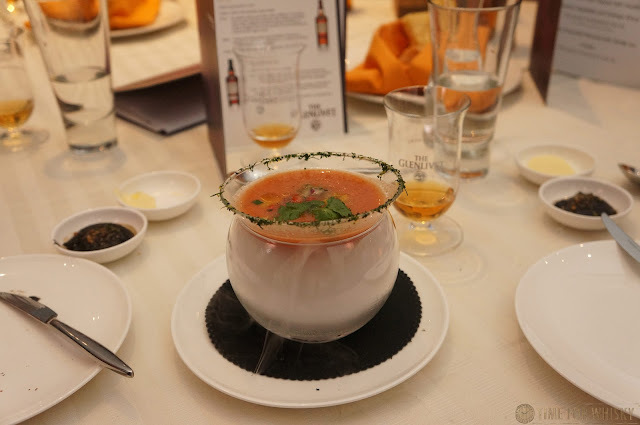 With each course Darren gave a brief intro, explained a little about the whisky and thought process behind the pairing, and that was it. 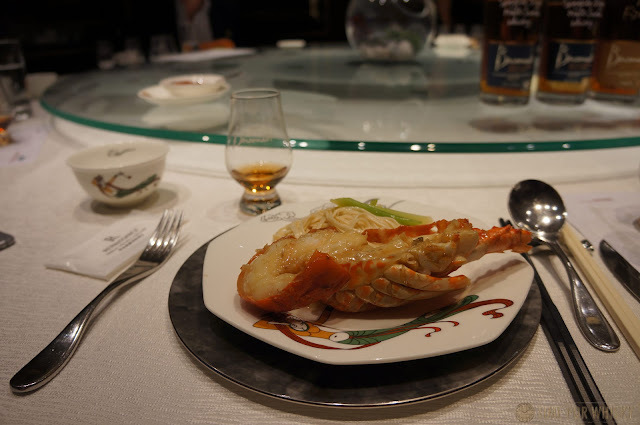 Guests seemed to appreciate the introduction, but also the chance to form their own thoughts on each pairing. With the courses finished (and an extra dram or two of the XXV to wrap things up) it was time to call it a night. 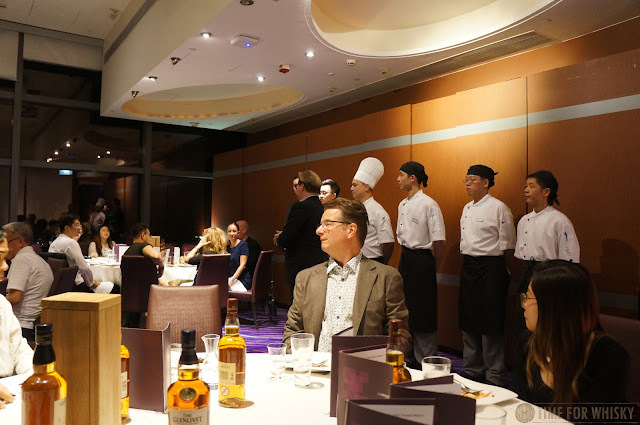 I'd have to say as the first Le Méridien Cyberport whisky pairing dinner it was a big success, and I look forward to seeing them run others in the future. 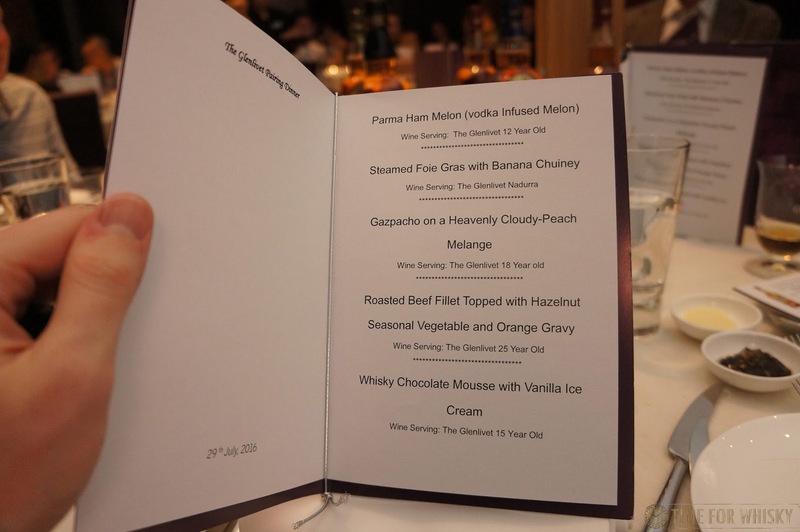 Whilst I'd kindly been given a ticket courtesy of Pernod Ricard, at $888/head the dinner was great value - especially when you consider you'd almost pay that for a single dram of XXV in some Hong Kong bars! 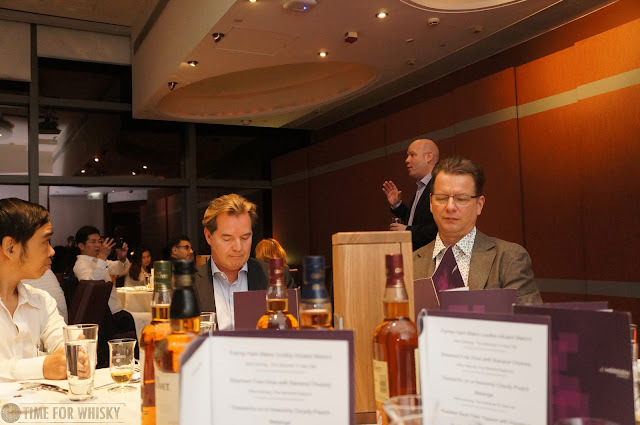 TimeforWhisky.com would like to thank Darren, Pernod Ricard HK and Le Méridien Cyberport for the invite. Joining the ranks of some of our favourite Aussie bars, including Whisky & Alement, Eau de Vie and Shirt Bar, is Queensland's The Gresham, recently been announced as Queensland's first (and only) Scotch Malt Whisky Society partner bar. 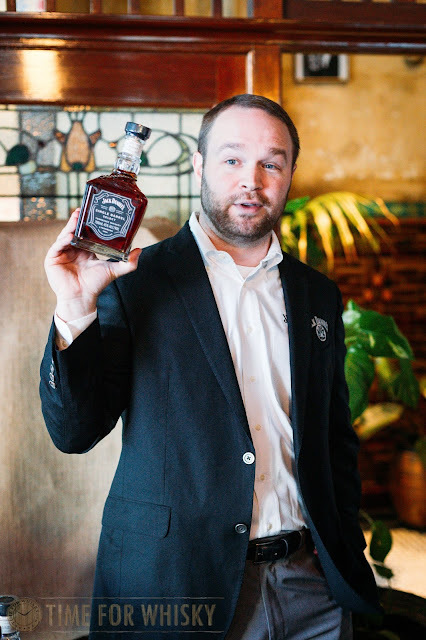 “What we look for in a partner is those who have a proven dedication to serving their guests the best spirits in the world,” he said “It’s not just about stocking the world’s best whisky, it’s about the people serving that product having extensive knowledge and are passionate about single cast and cast strength Scotch Malt Whisky. 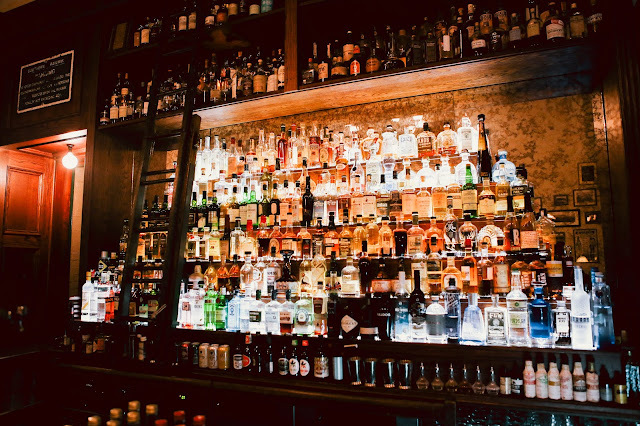 Ryan Lane’s the manager there, his team and the owners of The Gresham all have a demonstrable track record of excellence in product choice and knowledge, not just in whisky but in all the beverages they stock and the way they serve them”. One to check out if in Brisbane. We heard about this one a while ago, and now the Johnnie Walker Rye Cask Finish is available in Australia. 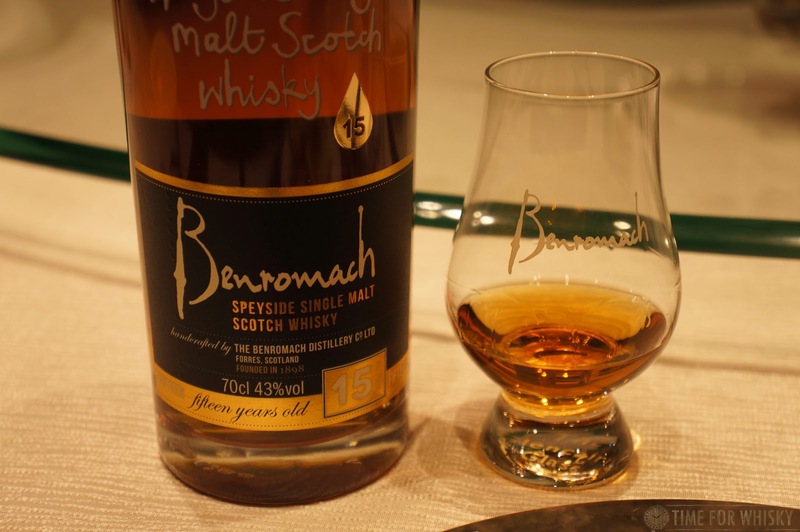 Whilst the "rye" in the name might throw a few people, this is still very much a blended Scotch whisky - just one finished in ex-rye whiskey casks. We love a good rye here so it'll be interesting to see what effect ex-rye casks have on a 10yo, Cardhu-heavy Johnnie Walker blend. Somewhat bucking the NAS trend, this one's bottled with a clear (10 year old) age statement on the bottle, and also at a healthy 46% ABV (as opposed to many blends nowadays, bottled at 40 or 43%). 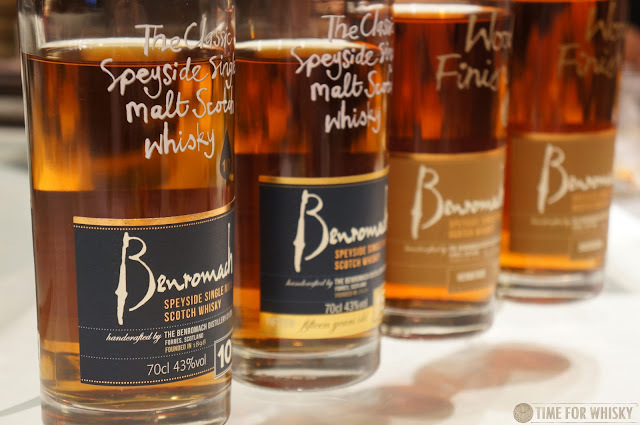 "Rye Cask Finish is a Scotch whisky blend that showcases the best of Scottish blending and maturation expertise and has already picked up numerous international awards including gold at The International Spirits Challenge 2016 and silver at the 2016 San Francisco World Spirits Competition. 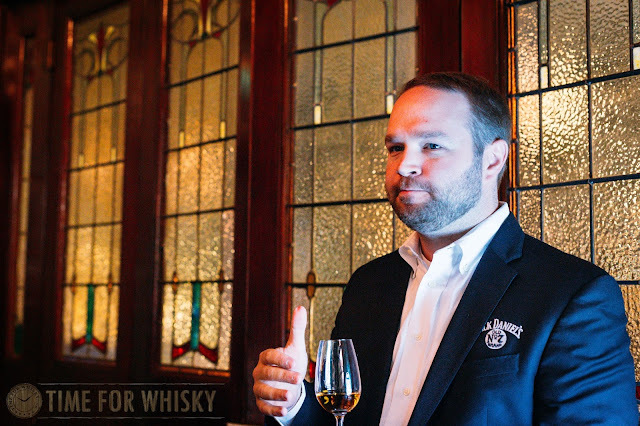 With Cardhu single malt at the heart of the blend, Johnnie Walker’s Master Blender Jim Beveridge used whiskies matured for at least ten years in first-fill American Oak casks. 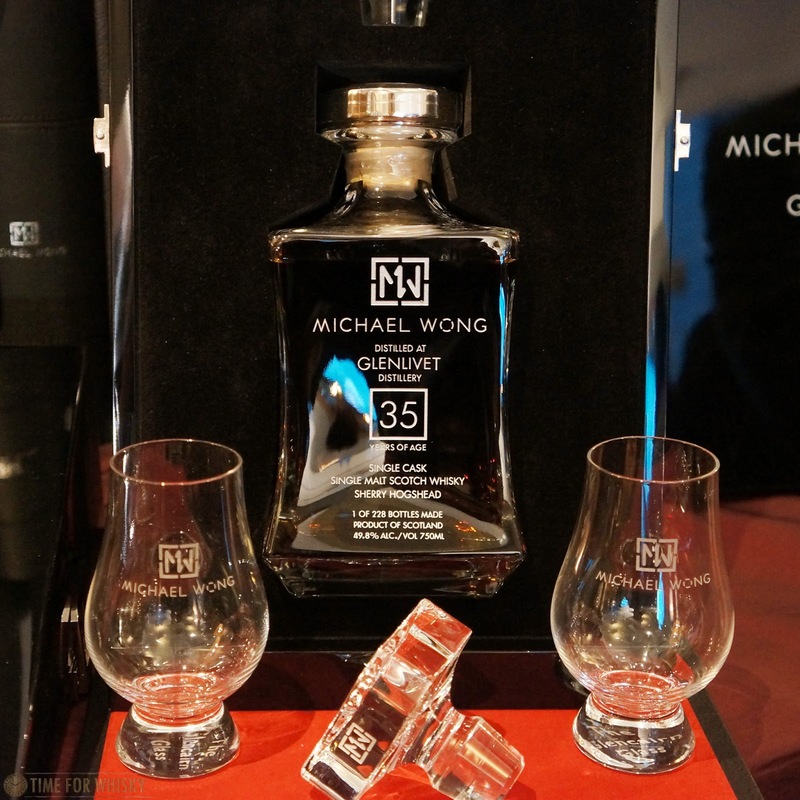 He finished the Scotch in ex-rye whisky casks, creating a complex new whisky with rich layers of flavour starting with creamy vanilla notes and transitioning to a more spicy finish. 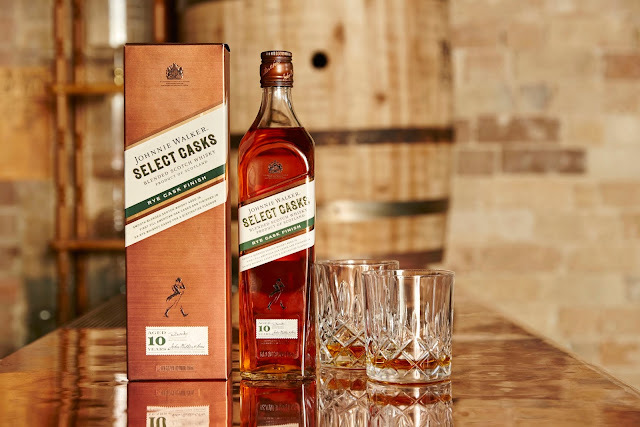 Johnnie Walker Select Cask – Rye Cask Finish is the perfect gift for Father’s Day (available nationally) and has a recommended retail price of $70 (700ml)." We'll hopefully have our own tasting notes posted in the near future. 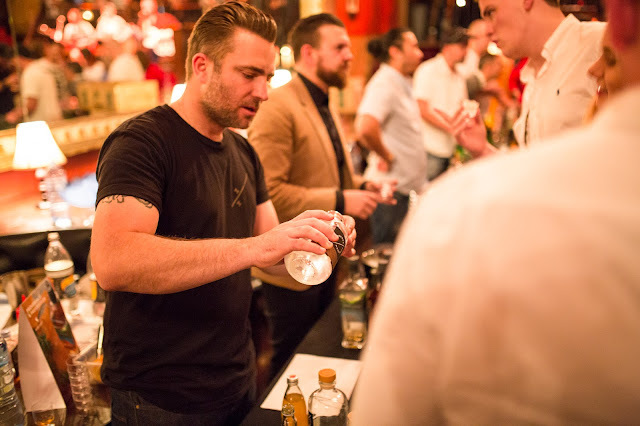 Not to be confused with Independent bottlings (aka "Indies" or "IBs") which often provide an alternative insight into a particular distillery, this event celebrates small, boutique, independent (I hesitate to use the word "craft") spirits. Brands on show will include Young Henry's (yes they do spirits now! 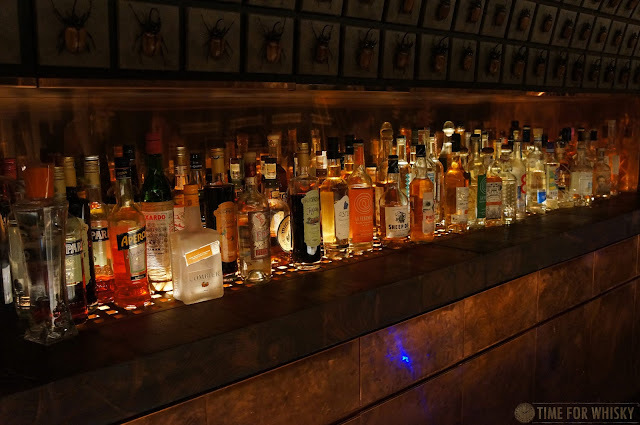 ), Poor Tom's, Applewood (their Red Okar is a pretty unique alternative to Campari), Adelaide Hills, Beenleigh, Husk Distillers, Hippocampus, Four Pillars, West Winds, Melbourne Moonshine and whisky distillery Whipper Snapper, not to mention six distilleries from North Carolina, including one producing a "blonde whisky" (?! ), which sounds intriguing. 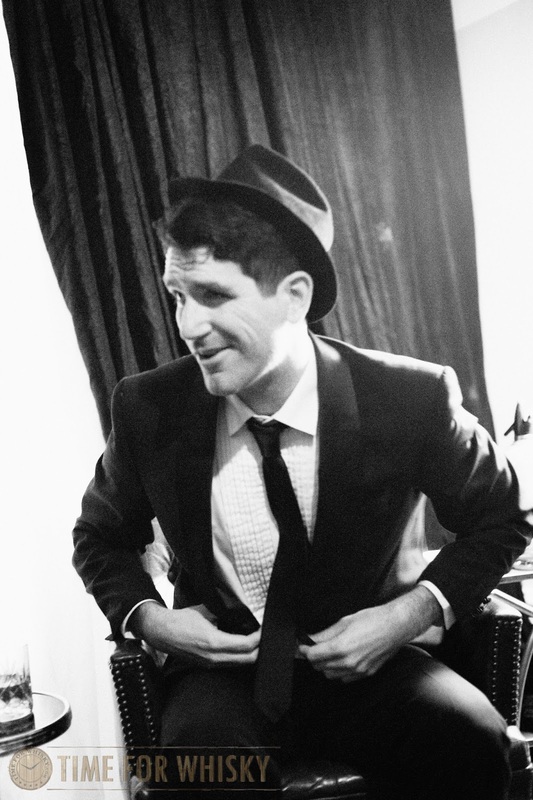 With tickets only $40 (pre-sale) or $50 (on the door), it sounds like a pretty bloody good way to spend a Sunday arvo. Tickets: $40 online, $50 on door (pending availability). Earlier this year Hong Kong's Landmark Mandarin Oriental welcomed famed NYC bar Please Don't Tell (PDT) for a pop-up, taking over the small upstairs part of MO Bar ("The Shell") and turning it into an incredibly realistic replica of the original bar. This September and October it's set to happen all over again, this time with Japan's Bar High Five - a Japanese cocktail institution and currently rated Asia's third best bar. Ensuring the utmost authenticity, the bar will be presided over by founder Hidetsugu Ueno (winner of this year's International Bartender of the Year award at Tales of the Cocktail). 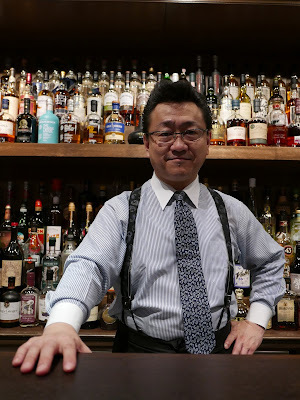 We've met and exchanged a few e-mails with Ueno-San over the past few years (most recently during this year's Tokyo International Bar Show + Whisky Expo) and as well as being an absolute master of his craft, he's a really nice, genuine bloke. 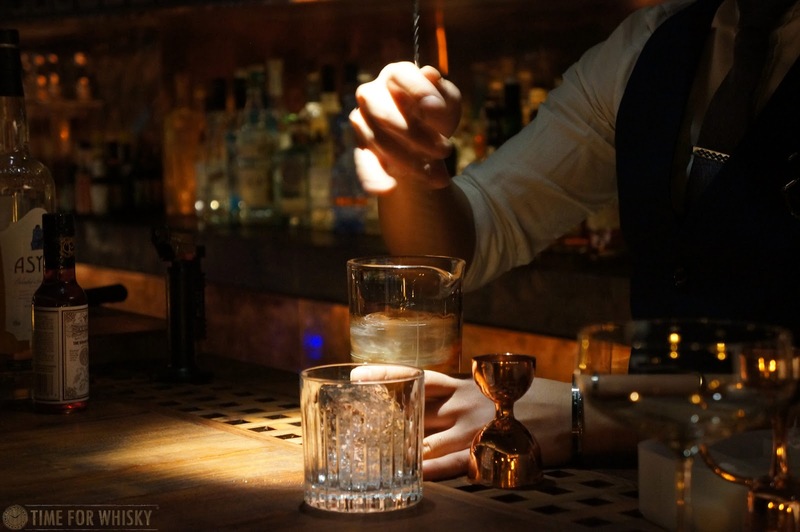 "With BAR HIGH FIVE founder and master bartender, Mr Hidetsugu Ueno, heading the cocktail-making team, the pop-up will open in MO Bar’s upstairs private room, The Shell, between 1 September until 31 October 2016. 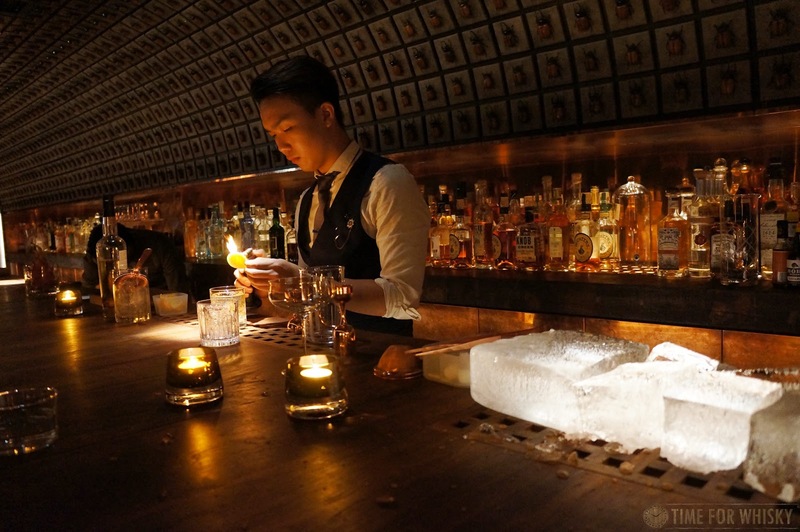 The Shell will be transformed into a jewel-box venue reminiscent of Mr Ueno’s glamorous Ginza institution. 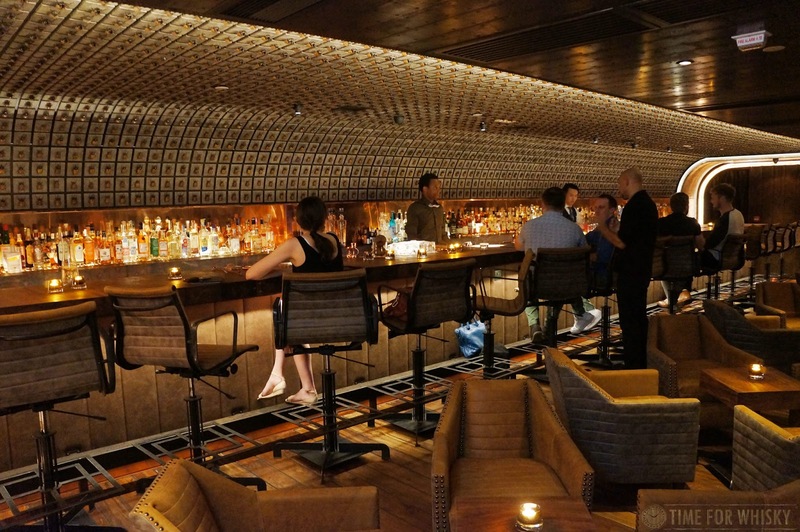 Guests are invited to join an Instagram photo contest to win a two-night stay for two people at Mandarin Oriental, Tokyo and visit the original BAR HIGH FIVE in the city’s Ginza district. To complete this exclusive experience, The Landmark Mandarin Oriental, Hong Kong’s Culinary Director, Richard Ekkebus, will present a bespoke menu of gastronomic treats, including charcuterie of Ibérico Bellota Ham and the finest Iberian specialities by Bellota Bellota." It's fair to say we're a little bit excited about this one. Stay tuned for a review and plenty of photos of the transformation in early September. 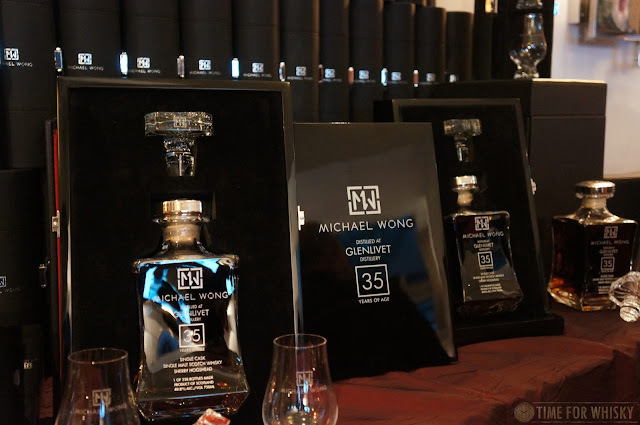 We've written about Dragon 8 Auctions a few times recently, though usually about the auctions themselves or the incredible bottles they've featured. 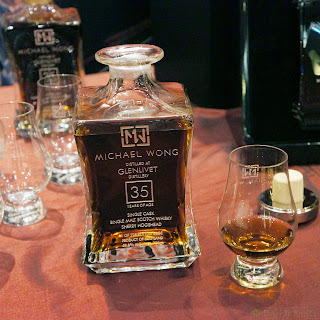 In 6 short months they've certainly established their whisky credentials here in Hong Kong. Not one to rest on their laurels though, Dragon 8 have recently released their own whisky, in collaboration with HK actor/singer/pilot/celebrity Michael Wong. 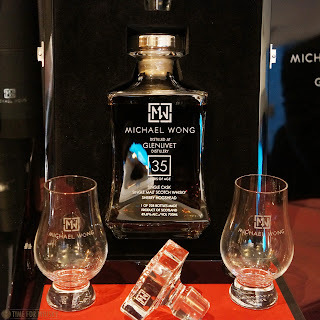 Not just any whisky, mind you - a 35yo single cask Glenlivet, well and truly from the days when the distillery was still using Golden Promise barley. 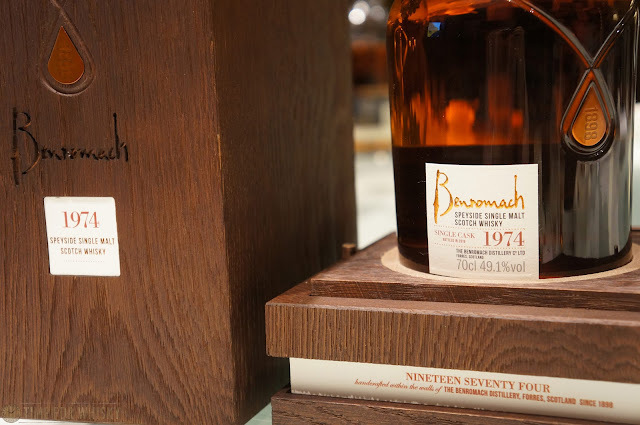 Bottled at 49.8% ABV, it spent its life maturing in a single sherry hogshead, and comes presented in an engraved decanter along with two engraved Glencairn glasses, all secured in an impressive display case and limited to 228 bottles. 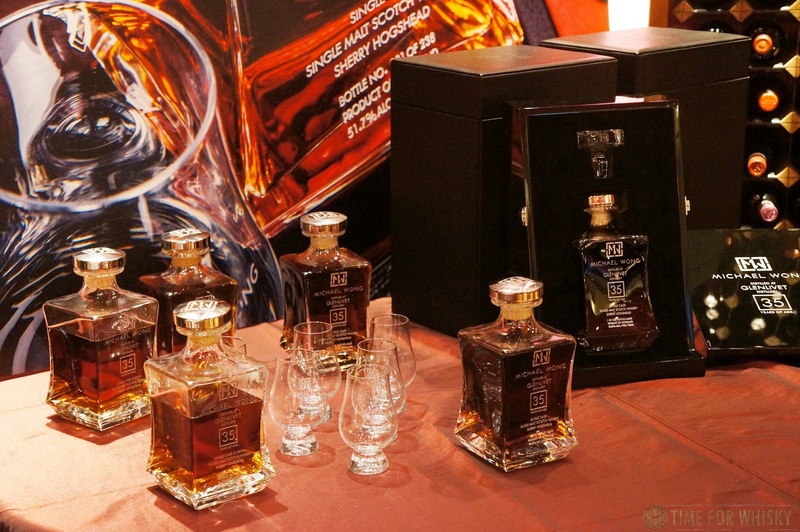 ..which is all very nice, but what I wanted to know was - what was the whisky like? Luckily Steph and I were able to answer that question recently, when Dragon 8 and Michael Wong held a launch party at Gaia Ristorante in Sheung Wan. Never one to do things by halves, Dragon 8 ensured the party was every bit a "party", with magnums of Champagne, excellent food, a band, a few tunes belted out by Michael, and even a trio of Brazilian dancers to ensure guests continued to party well into the night. 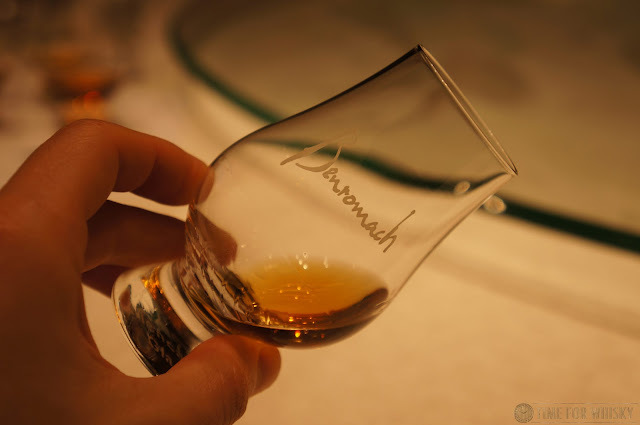 Nose: On first nosing there's no doubt this is every bit a sherried dram. Fruitcake, raisins, sherry-soaked prunes, it's all there. There's a hint of sulphur, but it's very minor and doesn't detract from the enjoyment at all. It's also, however, floral, fruity, with some hints of vegetation. The sort of unique combination of notes that usually only come with an extremely long time in oak. Palate: Clean sherry - no discernible sulphur. Creamy, fruity (raisins, sultanas, cherries) with hints of caramel chews. It's drying, but not in a bad way, and whilst there's a slight tannic mouthfeel, it works well. The oak is there, but only to let you know that it spent a good 35 years getting to know this whisky (it doesn't dominate the whisky). 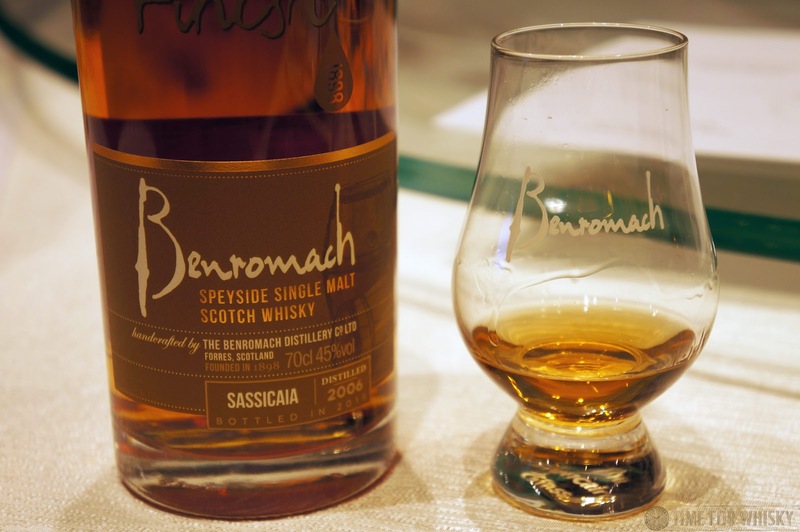 It opens up nicely with a few drops of water too, with the sherry fruity notes exploding onto the palate. Rating (on my very non-scientific scale): 91/100. A nice, clean, lovely-drinking sherried whisky - a whisky that strikes the balance between being able to be appreciated by whisky fans, whilst also being enjoyed by whisky novices (there were plenty of both on the night). The rarity obviously makes it a special occasion dram, but for those occasions its well up to the task. 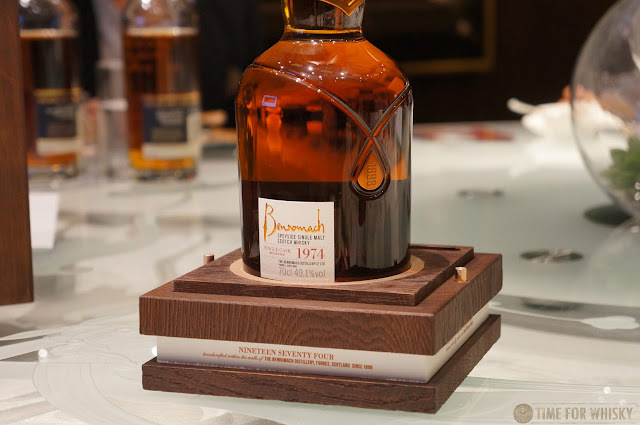 Update: A previous version of this article mentioned that this whisky was bottled by Signatory, information we took from the mock-up bottles at their Gamma auction in June (see last photo), and from this YouTube video. We have since been informed by Signatory Vintage Scotch Whisky Co. Ltd. that they were not involved in either the bottling or cask acquisition, or any other part of the final product (which is why their name is not present on the final decanters - only the early mock-ups). We apologise for any misinformation.